Industrial Workstation for security and protection of computer hardware, sealed to IP54 or IP65. The P Series industrial PCs were specially developed for installation in control panels, control consoles or switch-gear cabinets. The panel computers are characterized by their high scalability and large capability coupled with a small installation depth. Displays are available in 8, 12 and 15-inch diagonal sizes. A special mounting rack allows the devices to be installed easily, even in a 19-inch cabinet. Depending on the application area, the panel IPC can be fitted with various processor power, operating systems or memory expansions. The use of high-quality components makes the devices particularly suitable for harsh production environments that require reliable and robust industrial PC technology. As standard, the panels are equipped with highcontrast TFT displays with very long life expectancy and an integrated touch screen that guarantees good readability and simple operation even under poor conditions. The P12 is a universally usable Panel PC. 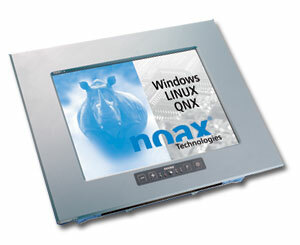 Depending on the requirements, the 12-inch version can be equipped with different kinds of noax all-in-one motherboards. Its scaling capabilities cover the processor power, the RAM memory, the hard-disk size or the operating system. The comprehensive on-board interfaces, the Ethernet interface and simple expandability using standard slots allow the uncomplicated connection of various peripheral devices using the standard slots. The distinctive feature of the 12 inch panel PC is its completely sealed enclosure for system protection against oil, water, dust or moisture.